Celebrity Chef Bobby Flay brings his interpretation of grilled southwest cuisine to the Vegas strip. The menu features unique and flavorful combinations of ingredients that only Bobby Flay can dream up! 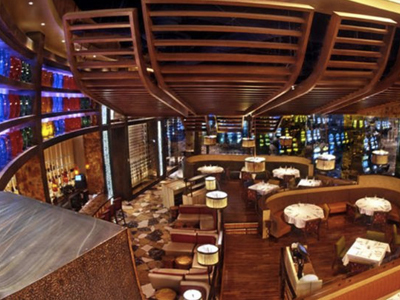 Celebrity Chef Bobby Flay brings his interpretation of grilled southwest cuisine to the Vegas strip. Step in and experience the hip vibe that feels more like West Hollywood than Vegas. A 20 foot rotisserie grill takes center stage and the vibrant colors and high energy level will be a great way to start a day or night in Vegas! For a guy from New York who trained in France, this place is Southwestern with a unique perspective! The menu features unique and flavorful combinations of ingredients that only Bobby Flay can dream up. Try the blue corn pancake with barbecued duck in a habanero sauce or the roasted pumpkin soup to start your meal. The gastronomic extravaganza continues with the spice rubbed pork tenderloin or the specialty rotisserie filet mignon. Always leave room for dessert because the seasonal specialties here are unique and worth the extra calories! 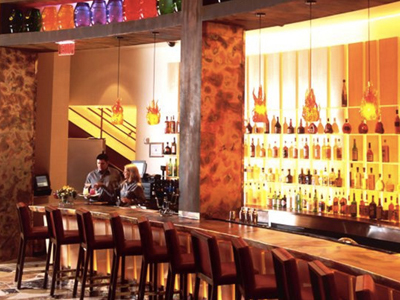 The highest quality tequilas and an expansive wine list will round out your meal. Stay away from this place it is awful! I had lunch at the bar on December 1 I had the pork tenderloin and spicy stuff on the side it tasted awful. I ordered tea and never got any tea but at least they didn’t charge me for tea. Took our son for his birthday dinner. Service A . The food was what we had hoped, great selection, and fine taste. We had a great time, and our son wants to plan a dinner experience with his friends next time in town. Highly recommended. Had lunch there and it was awesome. Have seen this place on tv before and it did not disappoint. Had the signature tiger Shrimp tomales and southwester pork sandwich and both were great. Would definitely recommend. My wife and I decided to give the Mesa Grill a try. We experienced 5 star service and excellent food. 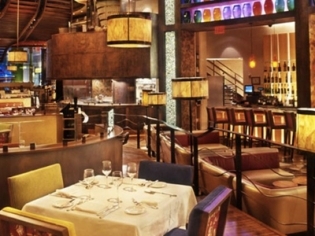 Comparing the prices to other places, Mesa Grill was a bargain. We will be back. From the moment we sat down, every piece of food we touched was of melt in your mouth quality. Each of the three samples from the bread basket were delicious. Our salads were unique and the bone-in ribeye and NY strip steaks were superb. I would definitely go back. It is well worth it. Also, the house Margarita was very smooth and delicious too! I would definitely recommend this restaurant. My girl and I went here for dinner. Everything was so freaking good! We got the chicken skewers for an app. So tasty! The peanut BBQ sauce that comes with skewers was ridiculously amazing. Only problem was there are only three skewers. For the main course she had the tuna, I had the chicken, and we shared the jalapeno mash potatoes. Everything was so full of flavor. The portions for the main course were more than expected but the mash potatoes were so good I wish I ordered my own. The margaritas were delicious. Be sure to ask your server for the margarita menu. I had the smoke margarita and it was a flavor I have never tasted before but so amazing. Would 100% eat here again and I highly recommend it! Bobby Flay nailed it! The ceviche was delicious, but I wanted more. Serving was a bit tiny. The chicken I ordered was very tasty as well. I’ve eaten at this restaurant twice and both times the food is been GREAT!